In the current business climate, competition for the top international jobs is fierce. Business schools are having to prepare their students to stand out in a competitive global jobs market. As its name suggests, EU Business School already offers students plentiful opportunities to get international experience, with campuses across Germany, Spain, and Switzerland. 37% of EU Business School students take advantage of the transfer opportunities available to live and study in different cities around Europe. But students don’t just get the opportunity to study abroad: they also get to stand up and compete in international competitions—focused on startups and social impact—with many of them bringing home big wins. 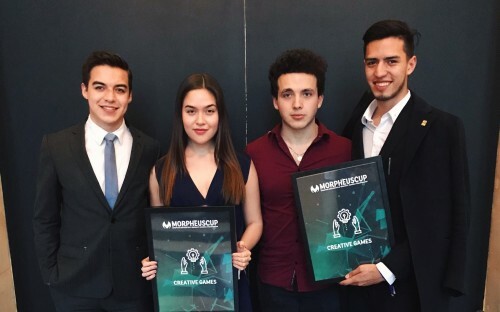 Three events around the world this year have seen EU Business School students make a big impression: the Change the World Model United Nations in New York City; the Digital Health Startup Weekend in Munich; and the Morpheus Cup in Paris. These experiences translate quickly into career success: the average time between graduation and employment for an EU Business School student is only six months, and 27% of EU Business School grads earn between 100,000 and 150,00 € per year. As soon as I received the email about the Change the World Model United Nations (CWMUN), I knew I wanted to participate. I got assigned to a country and a topic, in my case Narcotic Drugs in combination with Peru. My committee existed of motivated students from all over the world—we all had different visions on solving the problem, which made [it] even more interesting. At the end of the CWMUN, I was honoured to receive the Award for Best Delegate in the competition. This made my experience complete! EU Business School provided training in order to [prepare us for the competition, but] it is more the general experience of opening up to different cultures, and most of all the amount of presentations that I had to do [during my course that helped]. Public speaking is practiced a lot at EU Business School—I felt confident in talking in public and my speech was on point! I was involved in the Startup Weekend in Munich. Me and five other [students] got together and pitched a solution for migraine patients. By the end of the weekend, our team had won the prize for Most Innovative Idea. I met all my teammates for the first time during the event—it is [by] far the best networking experience I have ever had. For any businessman, his network is his net worth. This event provided a great opportunity to meet like-minded people, to build on any venture or ideas we had in mind. I applied to the Morpheus Prize, which is a competition in which you [submit] a startup idea and the best in Europe are invited to pitch in front of investors in Paris. I was invited to pitch, and once in Paris I also participated in the Morpheus Day. After the pitch there was a networking session with investors and fellow entrepreneurs. It is this environment where contacts are made, knowledge is shared, and ideas grow. EU Business School has a very small classroom structure which is a great asset. Class is a back-and-forth conversation with the professors rather than a thousand-slide monologue. It is very helpful to be able to have access to this type of knowledge—we have extremely gifted lecturers that have worked anywhere, and you can ask for advice so easily. I haven’t heard of any other university in which you can have such interaction and even a friendship with your professor. I would definitely recommend participating in the Morpheus Cup. The cost to apply is only sweat; you don’t have to pay for anything—there is no downside! I walked away from the Morpheus Day as a winner of the Creative Challenges after inventing an innovative way for an insurance company called Macif to reach more clients on their online portal. I left feeling extremely respected and appreciated regardless of my age and close to no work experience. Not only were people excited to listen [to my ideas], but they were excited to help in the process of figuring out my future career. I was given the wonderful opportunity to meet with many different representatives from marketing firms and innovative startups. The connections you’ll make and the exposure you’ll earn as a student of EU Business School will leave you in the perfect position to craft a successful future.